For tickets, call (402) 553-0800, visit the OCP Box Office or click here. Sisters Natalie and Alexis Reynolds are taking the stage together as Little Bo Peep and Little Boy Blue in this season’s A Christmas Carol. Although neither of them has been on the Omaha Community Playhouse stage before, they are no strangers to being in the spotlight. Natalie, 11 and Alexis, 10 were both enrolled in dance by their parents at young ages. They attend Cherrie Anderson School of Music and Dance in Millard where they are competitive dancers. They participate in six competitions a year, including nationals, and each dedicate 11 hours a week to practices. 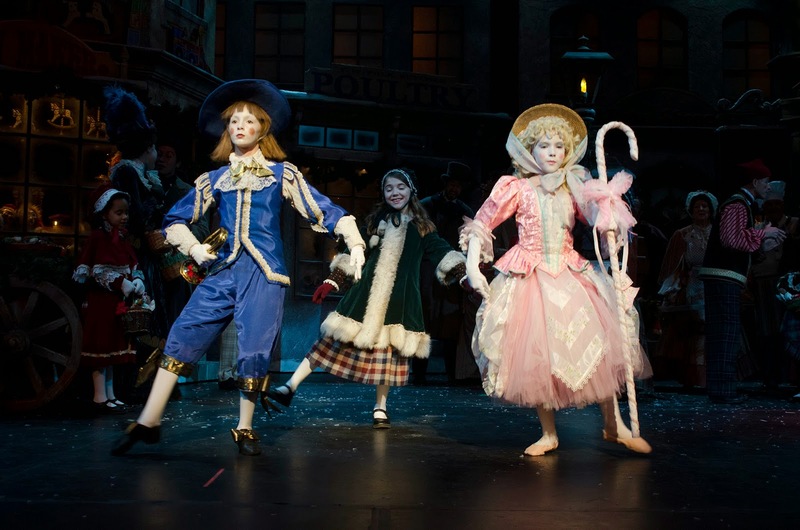 With roles in A Christmas Carol (both girls are also in the children’s ensemble) the girls are even busier than usual. Now that performances have begun, they dedicate 30 hours a week to the show and their dance practices. It is also a chance for the girls to work together. They will be able to help each other out and can practice together on the dance floor that they have at home. “It was nice that we both got a part and it wasn’t one part that we had to fight over,” said Natalie. After landing their roles in A Christmas Carol, both girls are interested in pursuing more opportunities through OCP; Natalie mentioned that she is thinking about doing some Broadway shows. For the time being, they are excited about the show. See A Christmas Carol at the Omaha Community Playhouse Nov. 21-Dec. 23, Wednesdays-Saturdays at 7:30 p.m. and Sundays at 2 p.m. and 6:30 p.m. Tickets are $36 for adults and $25 for students before Dec. 15 and $40 for adults and $29 for students Dec. 15 – 23. For groups of 12 or more, tickets for adults are $32 and tickets for students are $18. To purchase tickets or for more information, call (402) 553-0800, click here or visit the Box Office located in the southeast corner of the Omaha Community Playhouse at 6915 Cass St. The McGuigan brothers have been performing Yesterday and Today, a tribute to The Beatles, at the Omaha Community Playhouse for seven years now; it has become a staple during the OCP holiday season. Although performing in their hometown is a big part of their own holidays, it is not the only tradition they take part in. What are some of your holiday season traditions? What is your favorite? Matthew: Every year we put up a Beatles-themed Christmas tree. It's always fun getting a new ornament to hang on the tree. Ryan: Putting up the Christmas decorations. I think even as an adult, you feel like a kid. Billy: For me, December and the holidays mean the Omaha Community Playhouse. 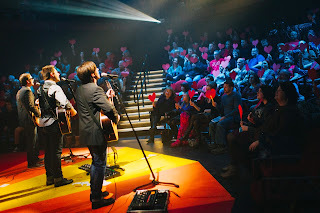 For over 10 years, I’ve spent every December in the Howard Drew Theatre getting to perform in shows that I love, while spending time with audiences that come back year after year. My favorite part is meeting the audience members after the show. It’s like an annual high school and family reunion all in one! What do you look forward to during the holiday season? Matthew: Spending quality with my wife, Christine, and son, Lennon. After touring all year, it's always nice to be home in December. Ryan: I look forward to the full month of Yesterday and Today at OCP. It's nice to be working from home during the holiday season. Billy: I love the holiday season energy that seems to be in the air. People hustling in the mall, families making holiday meal plans in the grocery store and bells ringing in the cool air. There’s just something about it that is unique to this time of year. Are there any traditions that you have continued from your childhood? Matthew: We always open presents on Christmas Eve. It's always hard to not give each other gifts before Christmas. Billy: The Christmas Mouse story! This is a story that our dad and his brothers used to tell us every year! It’s really just an odd story about a mouse that sees Santa and becomes his helper…my brothers and I told that story to my kids when they were little. You gotta love a passed-down family tradition! Are there any traditions from your past that you miss? Matthew: Probably just the excitement of being a kid, anticipating what gifts you will receive. I will say it's more fun being a parent around the holidays and seeing the joy on my son's face when he sees all the gifts he's about to receive. The Carpenters Christmas and being in awe of the illumination. It's probably the only time the McGuigan household was ever calm or placid. Billy: Growing up, our Christmases were always spent in Florida with our grandparents. This not only meant great weather for the holidays, but it always meant huge family gatherings. About 25 to 30 of us would cram into a living room and an older family member would act as obnoxious Santa Claus and yell everybody’s name while we would all laugh and tell stories. Such a fantastic time! Make Yesterday and Today part of your holiday tradition, Dec 5, 2014-Jan. 4, 2015 at the Omaha Community Playhouse. Thursday-Saturday shows are at 7:30 p.m. and Sunday shows are at 6:30 p.m. with a performance at 2 p.m. on Dec. 14. Tickets are $38 for single tickets and $32 for groups. There will also be a 7 p.m. performance and a 10 p.m. performance on Dec. 31. Cake and punch will be served on New Year’s Eve with a champagne toast at midnight; tickets will be $50 for the 7 p.m. show and $75 for the 10 p.m. show. To purchase tickets or for more information, call (402) 552-0800, click here or visit the Box Office located in the southeast corner of the Omaha at 6915 Cass St. 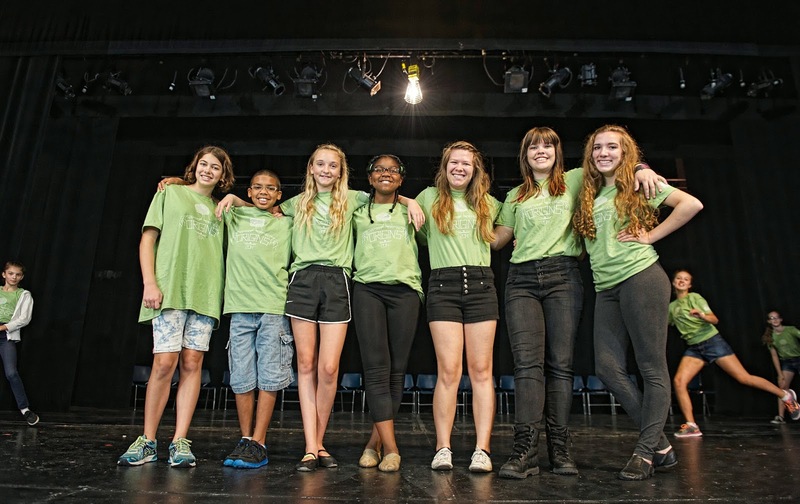 Kids come to the Omaha Community Playhouse First Stage Theatre Academy to learn all aspects of theatre. We are excited to have two First Stage students returning to OCP to apply what they learned in this season’s A Christmas Carol! Every summer OCP takes 30-40 kids into its First Stage two-week intensive. During the two weeks, students work with directors, musicians and choreographers; take classes in playwriting, scene study, improv and more; and produce and perform an original play. The program does not push its students into OCP auditions, but there always seems to be a few that have a real passion for theatre and seek out the opportunities. This year, those students are Henry Wisneski and Ahmad Ealy. Ahmad was first inspired by the theatre environment when his mother began working at OCP. In 2012, he saw A Christmas Carol for the first time and thought it was something he might like to pursue one day. “I got the vibe that I wanted to try out for it but I never knew when auditions were,” said Ahmad. Ahmad, a freshman at Westside High School, auditioned this fall and now has four roles in the production including Greenery Vendor, Marley Minion, Shepherd and children’s ensemble. “First Stage helped me in a great way,” he said. 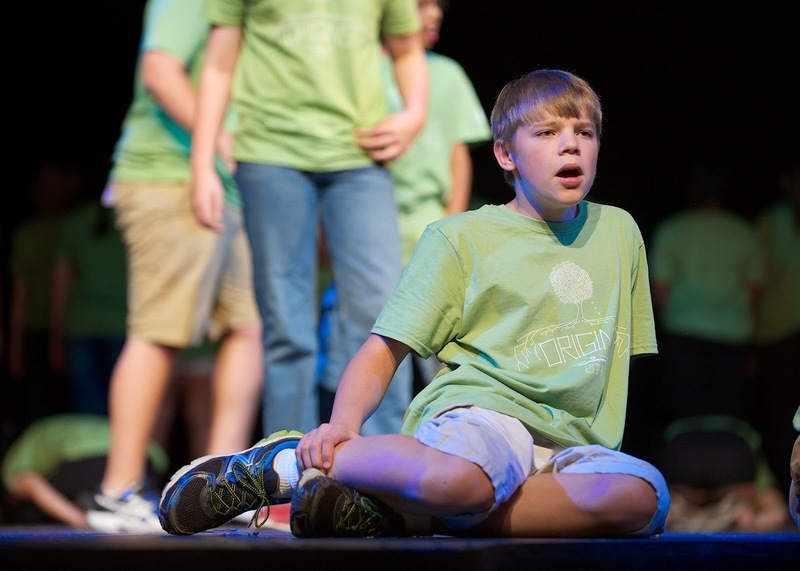 “I learned to be a better actor, singer and how to interact with people on stage.” Henry, an eighth-grader at Lewis and Clark Middle School, will be playing Young Ebby, a Marley Minion and Wise Man. We are excited to see Ahmad and Henry show off their passion and hard work in what is sure to be a wonderful show. “[A Christmas Carol] was spectacular back in 2012, but this seems like it is going to be a really good season,” said Ahmad.